Just when we started to Ooh and Ahh……???????? Well, it could provide some comfort if you went somewhere and the chairs were hard… but why would you want to sit on your bag? and for $2,280…. ??? 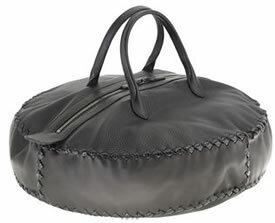 I could get a cushion in my lving room, sew a handle and a zipper in and have the same bag for much less. Yeah, that’s really ugly..and how are you supposed to carry that without it hitting everything.